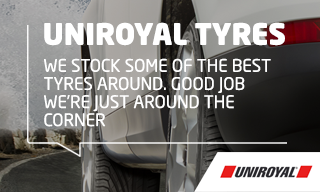 Uniroyal are synonymous with top quality rain tyre technology. All new products are uncompromisingly designed to provide optimum performance and safety in the wet. In over 30 years this has enabled Uniroyal to establish its unique market position as "The Rain Tyre". As the pioneer of the rain tyre, Uniroyal uses a range of wet weather tyre technology and has its products undergo extensive testing to ensure they live up to expectations. If you think that a rain tyre would suit your driving then ATS Euromaster might have a set to suit you, regardless of the size or type of your car. Rainsport 3 - As the name suggests, this tyre is great for use in wet weather. It offers excellent protection against aquaplaning as water is channelled through its longitudinal grooves. The tyre also offers excellent grip when driving around corners and short braking distances. It will not produce much interior noise either. Rain Expert - If you drive a compact car then this tyre is an excellent choice for you. It offers excellent traction in both dry and wet conditions, offering great protection against aquaplaning, short braking distances and a high degree of safety if you find you need to stop or turn quickly. This tyre is built to have a long lifespan. Rallye 4x4 Street - A great choice if you are driving an SUV, executive or luxury car. This tyre boasts fantastic performance whether operating in wet or dry weather. Because of a special silica compound that it contains, this tyre offers great stability and short braking distances. It also has good traction in light off-road conditions because of its robust design. To get more information on Uniroyal tyres and find the right set for you, try out our 'Find Your Tyres' selector or head down to your nearest ATS Euromaster centre where one of our technicians can help you choose the right tyre for you and get it fitted properly.